SUMMER OPEN HOUSE, Sat. Aug. 3, 1 to 5 pm. Free but donations of flattened cardboard boxes gratefully accepted. Also in Harmony that day is the annual Open House at Bartlettyarns. This historic operating wool mill is only open once a year and this is the day. In 2006 Margaret and Fritz Buschmann founded the non-profit Siesta Sanctuary as a home for parrots who have been displaced and need permanency. Parrots are wild animals that live 30-80 years. They are very intelligent and social and, in the wild, thrive as part of a flock. It is our mission to recreate the flock for parrots that have had their human flock disrupted; seldom can humans accommodate a pet through all the family life changes in 80 years! Our parrots have come to us from rescue organizations, owners moving to nursing homes or apartments, spouses objecting to the bird, birds with problem behaviors that disrupt the home and birds that other folks have rescued but couldn’t keep. All birds we take in will have permanent sanctuary. Here the parrots live in a flock, can fly and learn to behave like birds. Many birds that come to us have lived alone. Nearly all have found a mate or best friend. We delight in all this social activity and the odd couples that develop. 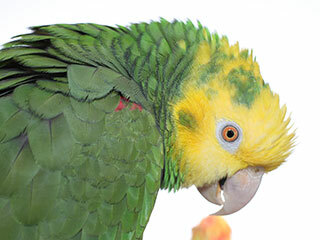 Siesta Sanctuary does not re-home parrots but can refer to organizations that do. Please consider a donation to help support this flock. The support shown for our mission and the parrots is truly heartwarming! I cannot tell you how much we appreciate all of you!!! Remember - you can visit throughout the year. Please just call first (207-683-6322) to make sure we are home and not embroiled in some messy project! 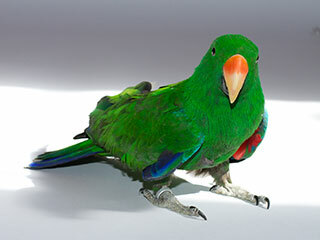 Come visit the sanctuary to learn about parrots, caring for them as pets, and threats to the survival of wild parrots. We can provide an educational presentation here for your group, school class, or organization. We have Open Houses scattered throughout the year and will post details here and on Facebook. To stay in touch Like us our Facebook page. We welcome telephone calls to talk about parrot stuff! We welcome visitors; please just call ahead so we are here and not embroiled in a messy project! We love volunteers! There are many small and large niches for help such as direct bird care, handyman services to stay ahead of the parrots' demolition, transporting cardboard boxes twice a month, chopping produce and preparing 80 salads daily, floor care, making parrots toys, socializing with parrots, anything that helps keep the birds happy! Volunteers set their own schedules - do one day a week or one day a month; IT ALL HELPS, and we greatly appreciate it! 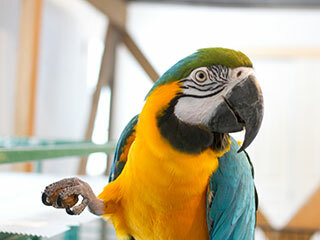 Report abused or neglected parrots to State of Maine Animal Welfare Program 1-877-269-9200. Make a donation to help feed and care for our flock of 80 +/- parrots. Volunteer; Call us to talk about help we can use. It costs roughly $16,000 annually (roughly $45 per day) to house and feed the flock. Any donation, large or small helps immensely! We are both semi-retired so we have more time to spend with the birds but less income. 100% of all money donated goes to the sanctuary's upkeep, and food and medical expenses for the birds. We are a 501(c)(3) nonprofit so your donations are tax deductible. If it is an in - kind donation of a cage or equipment, we can give you a receipt for the value of the item. TIME AND EQUIPMENT OVER THE YEARS!! We need another and a wiser and perhaps more mystical concept of animals. Remote from universal nature, and living by complicated artifice, man in civilization surveys the creature through the glass of his knowledge and sees thereby a feather magnified and the whole image in distortion. We patronize them for their incompleteness, for their tragic fate of having taken form so far below ourselves. Therein we err, and greatly err. For the animal shall not be measured by man. In a world older and more complete than ours they move finished and complete, gifted with extensions of the senses we have lost or never attained, living by voices we shall never hear. They are not brethren, they are not underlings; they are other nations caught with ourselves in the net of life and time, fellow prisoners of the splendor and travail of the earth.